As a peninsula, Italy claims miles of coastline. Add all its islands to the mix and beaches are truly abundant and one of the country’s most attractive features. 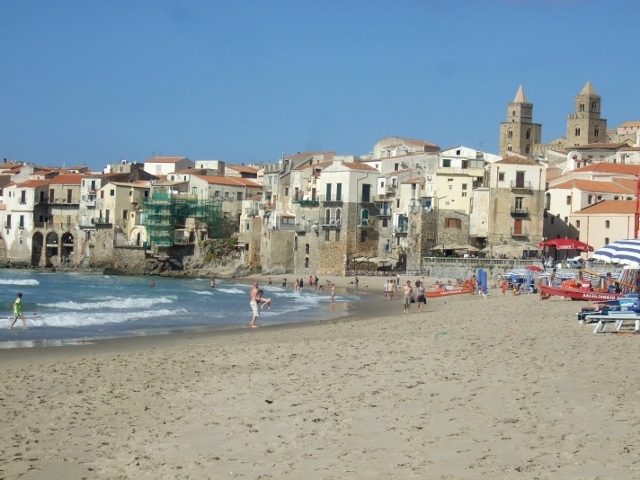 Southern Italy has some of the best beaches, and I had the good fortune to visit quite a few of them during my travels to Italy. With 7600 kilometers (or 4712 miles) of coastline, Italy leaves beach-goers an abundance of choices. 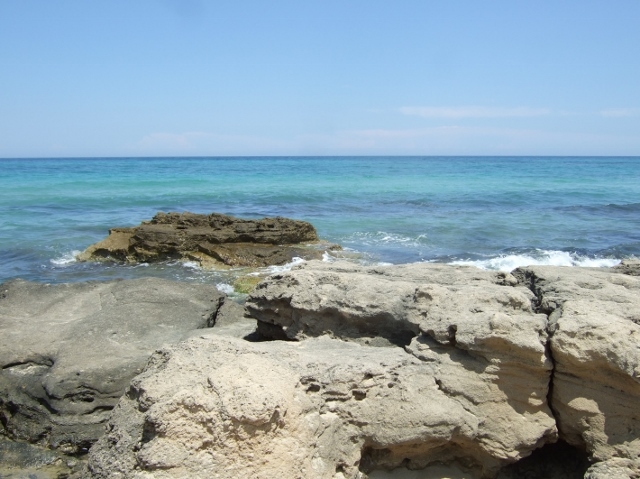 Here are some of my favorite beaches in southern Italy. The Amalfi Coast is known for its rugged landscape, magnificent views, and small towns built into hillsides. 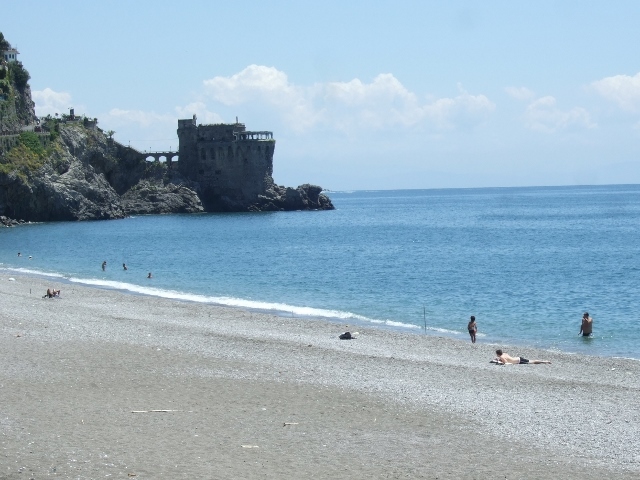 The beach at one of those towns, Maiori is a refreshing break from walking around exploring Italy on foot. Although the beach is grey and full of stones, the color of the water more than makes up for it. 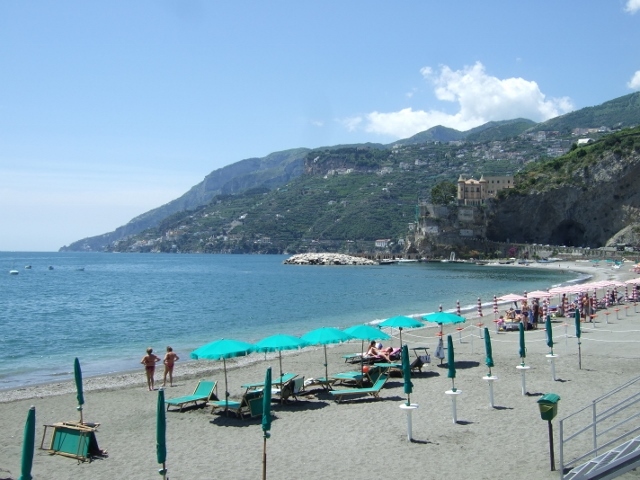 Maiori has the longest beach on the Amalfi Coast, almost a kilometer in length. Due to a terrible flood and catastrophic landslide in the mid 1950’s, Maiori’s seafront had to be largely rebuilt. Today it is a popular spot. The long promenade along the beach and many restaurants with beach views are wonderful. 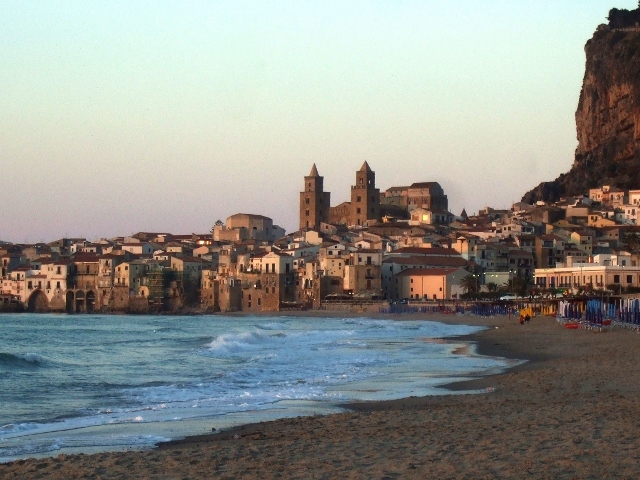 This northern Sicilian town is a big draw for both Italian and European tourists. Its turquoise shades of blue and green draw visitors to this lovely town all year round but especially during the summer months . The beach is crescent-shaped, the water is crystal clear, and the sand is clean and soft. 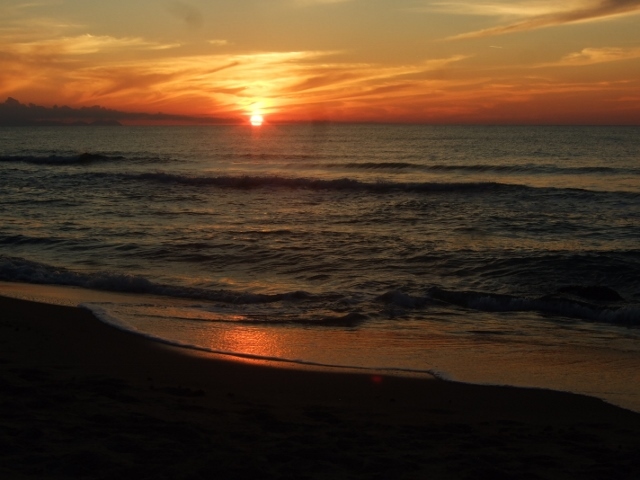 I once enjoyed one of the most spectacular sunsets on this stretch of beach and could have stayed here forever. Most hotels here have private access to the beach and the price of your hotel stay often includes the use of beach umbrellas and chairs, as well as changing and bath facilities. There is also a public beach area is here, where locals often bring their own umbrellas and enjoy the surroundings. The city known as the “White City” in Puglia is actually a few kilometers away from the beach, which is located at Pilone. 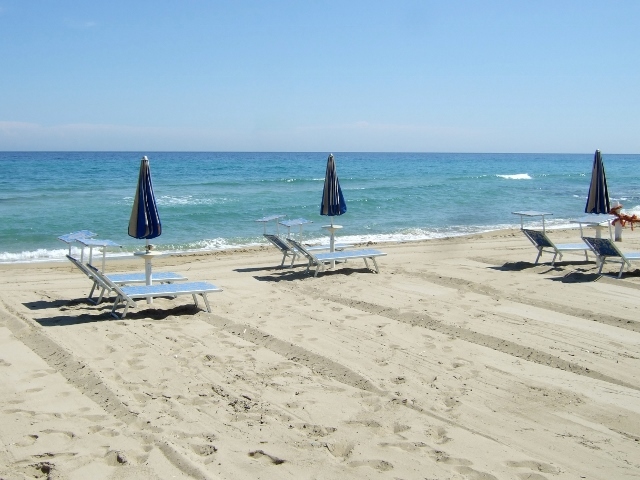 Most of the beach access here is private and arrangements have been made with Ostuni hotels. I spent a few hours at one such beach club, a complete beach resort minus a hotel. 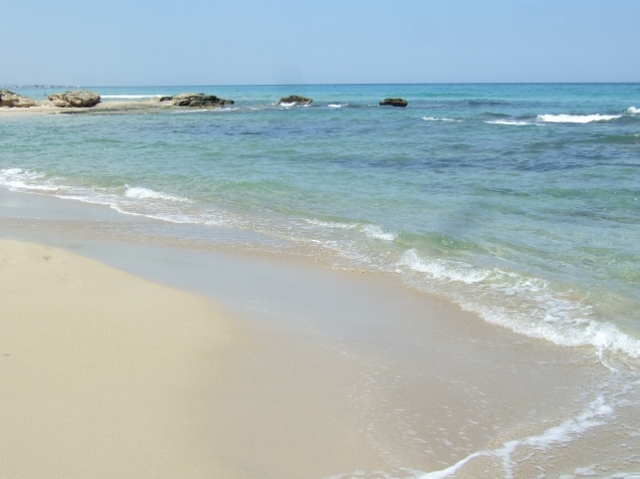 Unlike many other Italian beaches, the sand is soft and clean without stones. The blue waters of the Adriatic are lovely, and this area is very busy during the summer months. It seems a little remote and is not too commercialized, since the surrounding area is all olive groves, and not much else. I highly recommend a visit here if you are traveling to Puglia. What I love about the southern beaches in Italy is that they are not as crowded as some of those in the north. And even though they have their seasons, the temperatures stay warmer for longer with the beach sometimes an attraction in the off- season as well. As someone who yearns to be near the water, I was always happy to find these wonderful beach in southern Italy.see you on the beach! Margie Miklas is an American writer with a passion for Italy. She writes the blog, margieinitaly. Follow her on Twitter, FaceBook and Pinterest. She is the author of the award-winning book, Memoirs of a Solo Traveler – My Love Affair with Italy and also My Love Affair with Sicily. Why not combine a tour of the beaches of Southern Italy with a visit to the cultural hubs of the North in Florence, Rome and Venice? 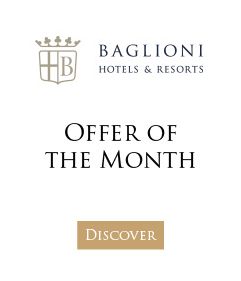 You can do so with the unforgettable Baglioni Tour – they’ll help you make all the arrangements to suit your exact needs.